Gentle Warriors: Clara Ueland and the Minnesota Struggle for Woman Suffrage, by Barbara Stuhler. MNHS call number: JK1911.M6 S78 1995, also available for purchase. "Organizing for the Vote: Leaders of Minnesota's Woman Suffrage Movement," by Barbara Stuhler. In Minnesota History, vol. 54, no. 7 (fall 1995): pp. 290-303. Minnesota Woman Suffrage Association Records. 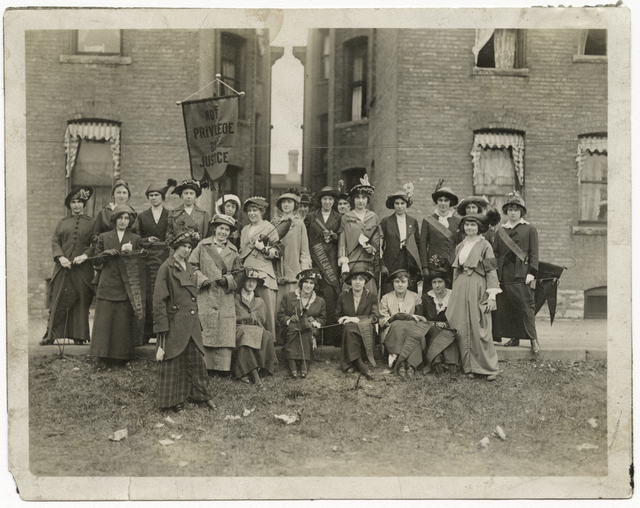 The MWSA was founded in 1881 to coordinate statewide and local efforts to obtain universal equal suffrage for women. The collection contains correspondence, minutes and other record books, subject files, printed materials, newspaper clippings, scrapbooks, and miscellany, that provide information on the MWSA's organizational work at the state, district, and local levels; on public attitudes toward suffrage issues; on life in small-town Minnesota; on interstate cooperation among suffrage groups; on the role of various non-suffrage organizations in the movement; and on suffrage and related bills introduced into the Minnesota legislature. There is a history of woman suffrage in Minnesota, by Julia B. Nelson (ca. 1900); data on a convention of the Mississippi Valley Suffrage Association (1916); an extensive file of pro- and anti-suffrage literature; and information on peace, temperance, child welfare, women's rights, voter education, and other issues of interest to the suffragists. League of Women Voters of Minnesota Records. The League of Women Voters of Minnesota (LWVM) was organized in October 1919 in meetings called by the Minnesota Woman Suffrage Association. Clara Ueland served as its first president, and after a few months she was succeeded by Marguerite Wells. In the early years the League's objective was the political education of the newly enfranchised female voters. Soon, however, the groups broadened their scope to include voter education in general, study of legislation, determining individual legislators' positions on issues, and communication of that information to the local leagues. Among the many areas of interest were social welfare measures, natural resources, pure food and drug measures, disarmament, trade, foreign policy, civil service, the World Court, the United Nations, government organizations, education, public finance, control of atomic energy, and civil rights. Reflecting the growing interests in environmental and women's issues, the League extended its programs to include these areas, as well as encouraging further participation in the political process by disseminating information on precinct caucuses and political parties, preparing questionnaires and interviews of political candidates, and sponsoring candidate debates on the local and national levels. Women began campaigning for suffrage—the right to vote—in the United States in the mid-1800s through marches, rallies, speeches, and appeals to legislatures and the Congress. They were dismissed, ridiculed, derided, and often abused for their efforts. The first capacity in which women were able to vote in Minnesota came in 1875, when a constitutional amendment allowed women to vote in school board elections. Minnesota was a key player in the national fight for women's suffrage. In 1881 a group of women founded the Minnesota Woman Suffrage Association in Hastings, Minnesota; its first president was Sarah Burger Stearns. The MWSA hosted the American Woman Suffrage Association's annual conference in October of 1885, which brought the MWSA and women's suffrage in Minnesota to the national stage. In 1893 the MWSA tried but failed to pass an amendment guaranteeing women's suffrage. For the rest of the 19th century and into the 20th the MWSA would try to pass legislature concerning women's suffrage, but would eventually fail. In 1914 Clara Hampson Ueland organized a parade of over 2,000 woman suffrage supporters in Minneapolis, which brought renewed attention to the cause in Minnesota. Ueland eventually became the president of the MWSA, and in 1919 when the 19th amendment to the constitution of the United States was brought before the Minnesota legislature, it passed. On August 18, 1919 it was ratified by the United States congress. Guide listing resources available at the MNHS Library.